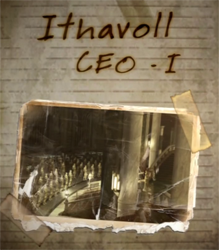 The Ithavoll Group, once a medium-sized IT company, through acquisitions has broadened its business base and become one of the world's leading conglomerates. 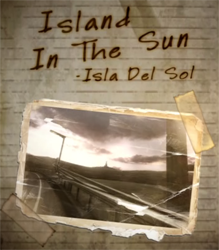 Their base of operations is on a man-made island off the coast of Vigrid known as Isla del Sol. Isla del Sol was initially constructed to concentrate Vigrid's urban functions in one area and facilitate expansion; however, its true function is to funnel enormous power to the ruling authorities, creating an autonomous region under Ithavoll Group control in order to facilitate the creation of a theocracy. 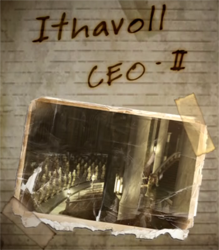 The CEO of the Ithavoll Group, claiming to be a descendent of the Lumen, has used his economic and political strength, even exploiting the faith of the people, to bend Vigrid to his will. That is how he was able to influence the construction of the island, as well as the city's urban planning, to match his own religious views. Buildings are lined up as it they were an enormous spiral being drawn towards the centre of the island, a symbol of the Trinity of Realities known as the Cosmos of Chaos. Among these urban structures, there are SAM-equipped strategic defense sites known as Gjallarhorns, tall buildings creating a skyward barrier that is nearly impregnable. At the centre of this curtain of defence lies the Ithavoll Building, the heart of the Ithavoll conglomerate. I've been able to obtain important information regarding the building itself. While it may be the outward symbol of the city's wealth and pride, the inner sanctum of the building is home to advanced energy research that the Ithavoll CEO is secretly using as leverage that he hopes will allow him to remake the world according to his vision. It sounds absurd, but I've seen things on that island so strange that I believe it now with all my heart and soul. The Ithavoll Group holds complete control over Vigrid, planning the city and arming it to the teeth, all while using rhetorical flourishes to conceal the conglomerate's many dark facets. The company's vast political and economic power has created an island held as the symbol of modernity, Isla del Sol, and placed its headquarters at the symbol's very centre. At the conglomerate's top stands a man said to be a descendent of the long departed Lumen, a man who has earned the adoration of the people - Balder. Balder is, as they say, a mystery wrapped in an enigma. If he is truly one of the descendants of the Lumen, that would mean that the blood in his veins has been pumping since their extermination some 500 years ago. However, even if you look back through decades of Vigrid's records, there is no knowledge of anyone with a Lumen lineage. Furthermore, if you search for information on his hometown, schooling, work history, or family, you find that it has all been forged. There is no record of his life before Ithavoll, nor are there any stories of unimpeachable veracity. It seems like he has been hiding details of his life ever since his birth. I have already chronicled the unprecedented military expansion and turbulent movements related to next-generation energy research taking place in Vigrid. However, a man who has for years, or even decades, hidden the facts of his life is now at the very pinnacle of power of a conglomerate with literally earth-shaking might. The question begs to be asked - What is this man capable of? There remains one thing that worries me about Balder. There are rumours that he has been partaking in the game of the Lumen Sage, in other words, feverishly hunting out any remaining Umbra Witches, in order to facilitate his next-generation energy research. It is hard to believe that a member of that clan, though to have crumbled away 500 years ago, still remains unbeknownst to the world at large; however, when considering that they are purported to have wielded massive power as overseers of the world, the word that this self-styled sage Balder is actively seeking a witch forces one to have major qualms. And of course, while the sound of research into "next-generation energy" is incredibly attractive, the marvellous ascent of Balder, as well as his start-up company, and his control of an arsenal of armament and fortifications, has all been conducted under a cover of total media control. Could one honestly say that all this secrecy would be needed for something that has peaceful uses? Another troubling sign is the ease of which one can acquire information regarding the Ithavoll conglomerates as of late. It may just be my journalistic sense, but I feel there is a possibility that Balder is intentionally leaking information. If we make that assumption, that leaves me with no way out. Ever since I began covering Vigrid's transformation and the dark shadow behind the Ithavoll Group, I have been on an inescapable crash course with the truth. Even if it was a trap, and I must overcome that trap to get to the truth, I am hell-bent on doing so. If you find this page undestroyed and in the hands of another, that means something has happened to me. I wrote these notes in case that very "if" should come to pass; however, it still makes me wonder how far I will have gotten on my journey. Maybe I've been able to grasp some sort of truth from the darkness of confusion; maybe I've been able to give my son the understanding of what it means to truly believe. 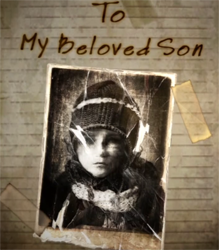 To the son I love more than anything in this world, if you are the one to read this, forgive me for throwing myself into work and thinking little of our family. I am a foolish man, much too attached to my beliefs and entirely unable to change. I am sure that this has caused you immeasurable trauma. Bow you set off on your own journey down this long hard road we call life. However, as a father, I have nothing I can teach you and even less I can leave you. Hopefully, you will remember the short time I spent with you as a token of my love. I pray that if will become for you a roadmap to a life of substance.